Available in the Sale-A-Bration Catalogue in the new year! Can you believe it?? Christmas is just FOUR. DAYS. AWAY! And if Christmas is four days away, that means the NEW YEAR is not too far behind. And if the New Year is not too far behind, that means the Occasions Catalogue AND Sale-A-Bration are starting in less than 15 days - SQUEEEEEEEEEEEEEE!! Do you love it??? 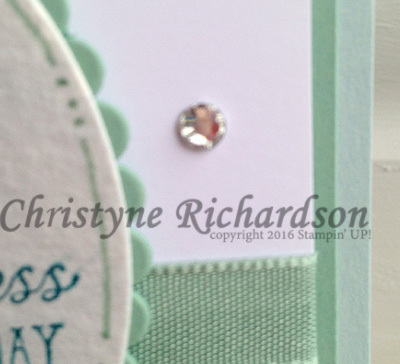 It's from a new set (available in the Occasions catalogue) called Beautiful You and it's just perfect for creating a quick and easy card. I coloured it in using the NEW (also available in the Occasions catalogue) watercolour pencils and in less than five minutes I had a card ready to send (it's waiting on the desk of someone very special already). Don't forget to check out what the rest of the crew have been up to HERE, and take note that due to the holidays, this is a TWO week challenge. 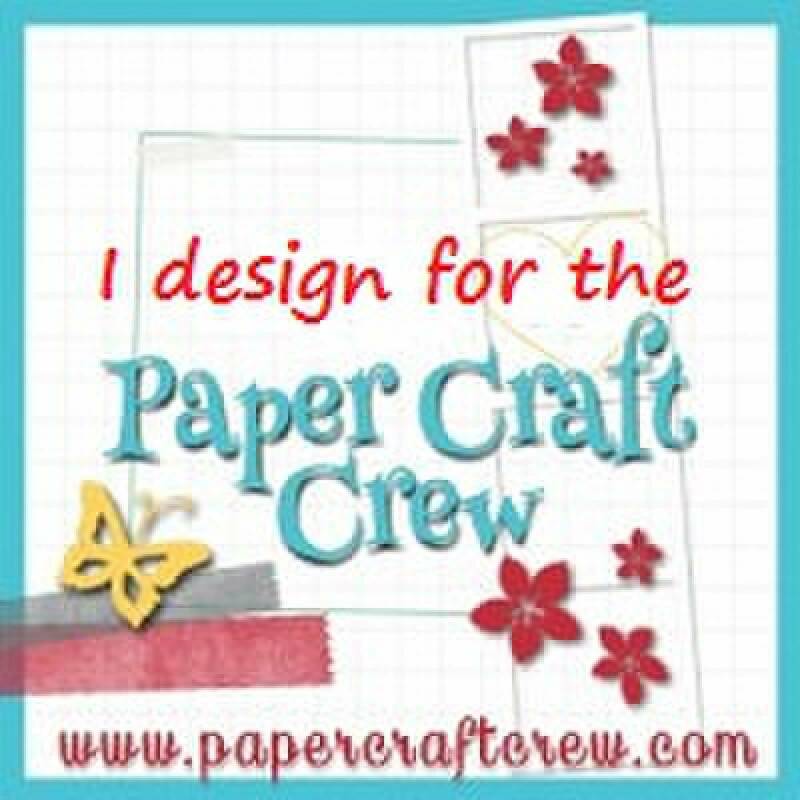 I'll be back with another Paper Craft Crew challenge on January 4th, 2017. 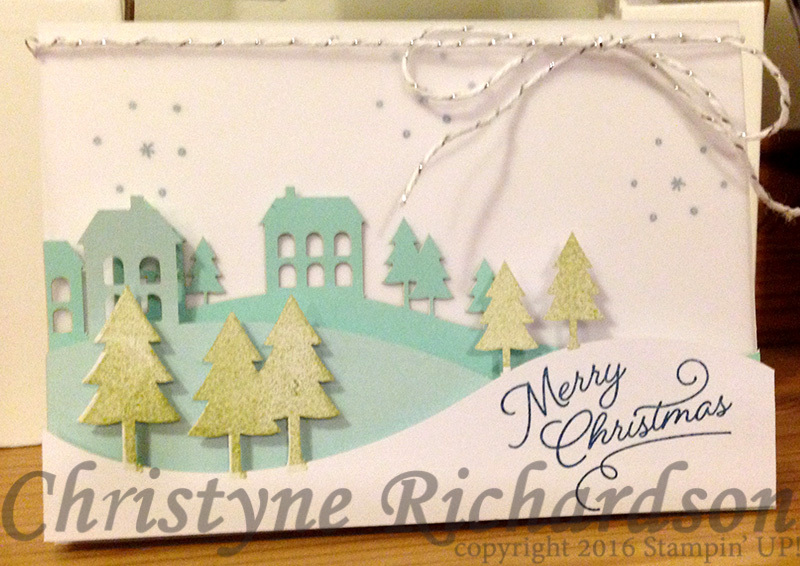 With the help of a LOT of Stampin' Dimensionals (they're in the kit) I created this adorable little Christmas scene and I just LOVE IT!!! Now...the good news is, if you're already a Paper Pumpkin subscriber, Stampin' UP! is releasing the REFILL KITS for purchase (in case you need more) and you can order them right HERE. But they're only available while supplies last, so don't wait! The set is called "Hey, Chick" and you can get it for FREE during Sale-a-Bration. I used the new watercolour pencils (Yes! You read that right!) and my blender pen to colour her in. 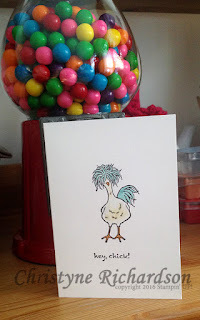 I love that in "Stampin' Land" chickens can be what ever you want them to be and even have Bermuda Bay hair! It wouldn't be Christmas if there wasn't a last minute project on the sticks! I am FINALLY done the hubby's Christmas cards for his office...it's a good thing he's cute, because YIKES! Talk about a labour of LOVE! 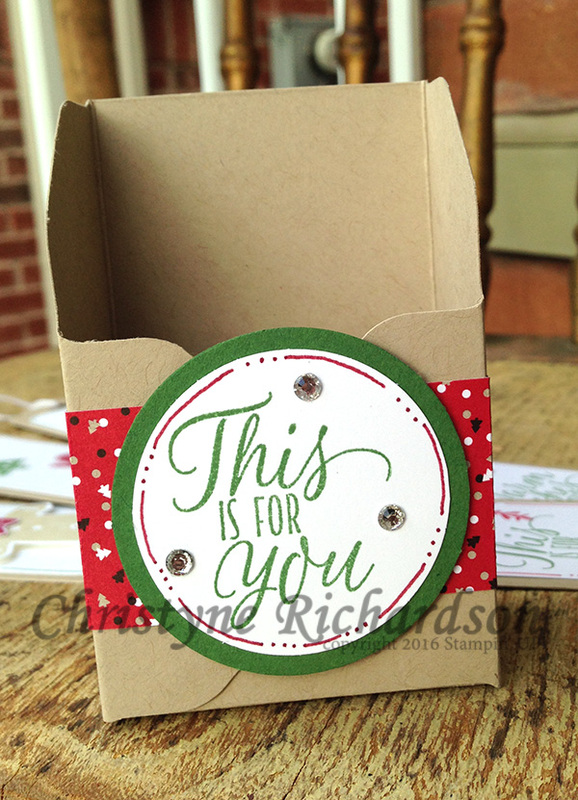 Today's "not a card" is one of my favourite quick and easy packages to make. 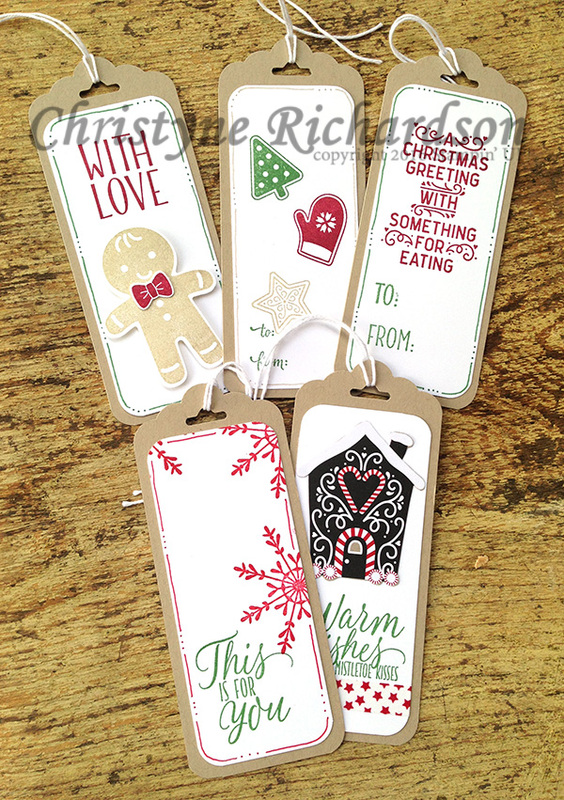 A little bit of Designer Series Paper, a stamp and a die cut or two and you're good to go! We made smaller bags at class, but you could totally apply this principle to a larger bag. Then again, good things come in small packages, right?? 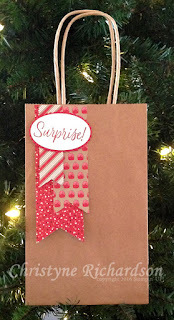 You can purchase the bags at any big box craft store and they come in several different sizes. They're usually available in a "baker's dozen" (13 bags), so you should be able to design lots of different gift bags, depending on which DSP you choose. The strips for this bag are 2", 1 ½" and 1" wide. You could adjust the length to suit your needs. They were punched using the Triple Banner Punch. This is a fabulous punch, because you can use it with three different widths of paper...so it's like getting three punches in one - BONUS! The "Surprise!" is from the Tin of Tags stamp set. 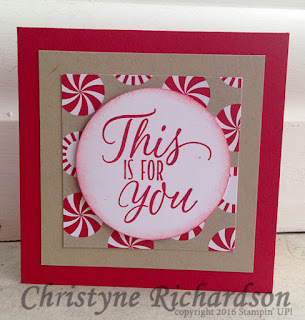 It was stamped in Real Red onto Whisper White Cardstock and cut out using the Big Shot and an oval die. 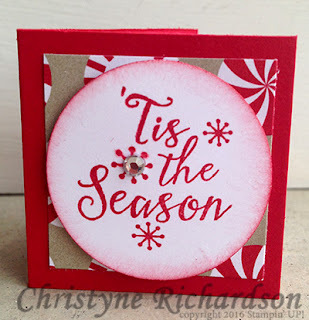 It was adhered to a Real Red piece of Cardstock also cut out using a scalloped oval die and the Big Shot. You could use any stamp really. It doesn't even have to be a Christmas gift bag. It could be for any occasion throughout the year. Why not buy that baker's dozen of bags and create 13 different designs? 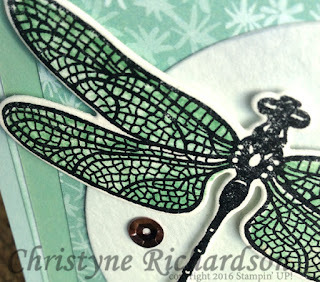 So...you remember last week when I said I'd probably thrown out the second dragonfly I'd stamped while tidying up? Yeah...about that...turns out I should have tidied my messy work space a little MORE because I found the image - WOOHOO!! 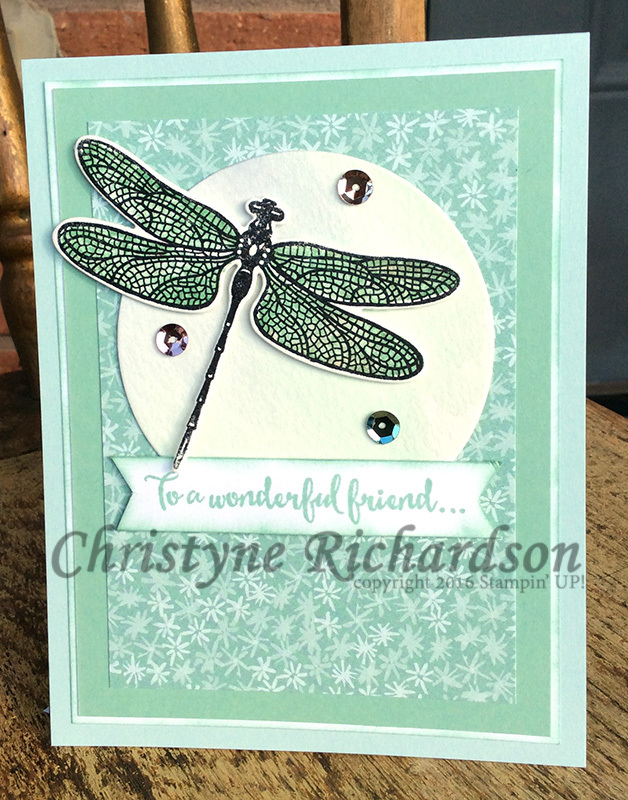 I am SO in love with the new Dragonfly Dreams set coming up in the Occasions Catalogue - can't get enough of it! I started off with a base of Thick Whisper White Cardstock and added a piece of Blooms and Bliss Designer Series Paper with a little sliver of Mint Macaron Cardstock tucked underneath it. Then I tied some Whisper White Baker's Twine around the whole card and tied a pretty bow. The circle under the dragonfly image was sponged using Soft Sky, Island Indigo and Mint Macaron and I just love the way it turned out! So much so...that if you're attending the Canadian Business Conference in January and you just happen to be in the Dragonfly Dreams group, THIS is the card I'll be swapping! I hope you love it as much as I do! 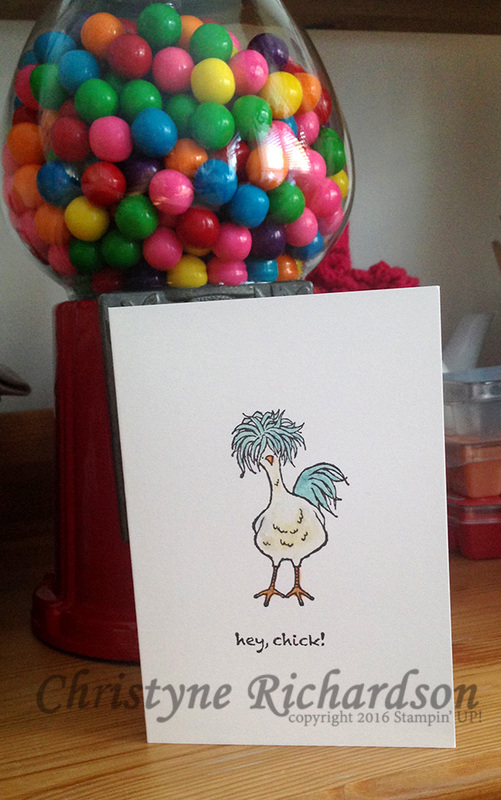 This card went in the mail right after I made it, so I hope the recipient has it already or the surprise might be ruined. Either way...I'm sure she'll LOVE it! P.S. 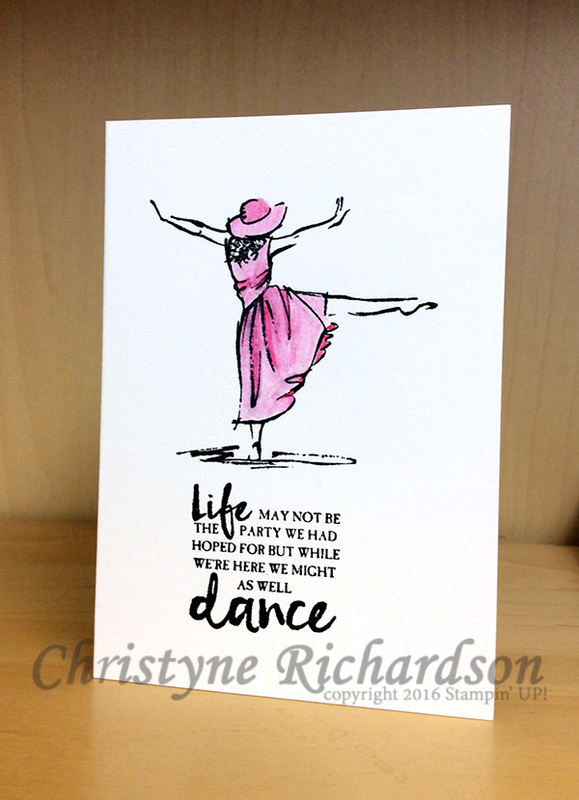 After the photo was taken and before I mailed the card, I added some rhinestones...because I finally found them too! I teach classes. Once a month. And in those classes we use a LOT of Whisper White Cardstock. 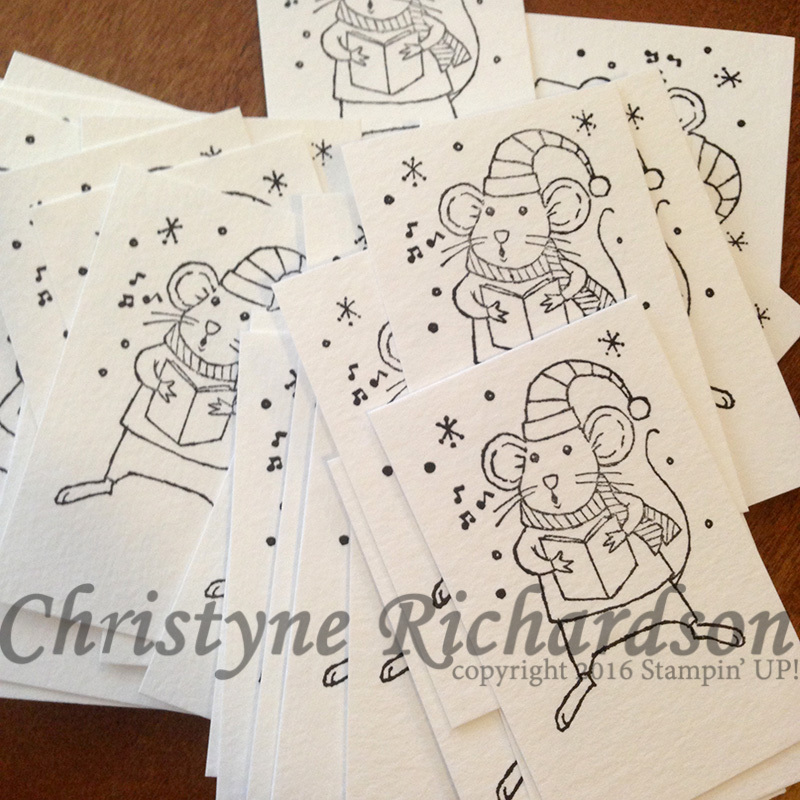 And most of it is cut 4" x 5 ¼" as we use it for the inserts in our cards. That leaves a LOT of ½" x 11" and ½" x 4" pieces of Whisper White Cardstock laying around. I mean A LOT. Like HUNDREDS of those little strips! I can't possibly use them all, so a bunch of them just end up in the recycling. But at this time of year, I'm thankful for all those little bits that I DO keep!! 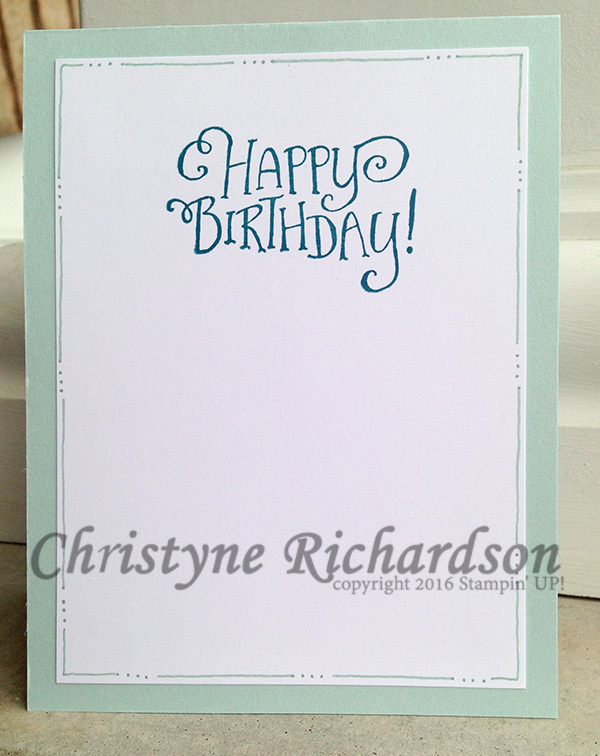 Because they make adding skinny little sentiments to the front of cards MUCH easier! So close I can taste it!! 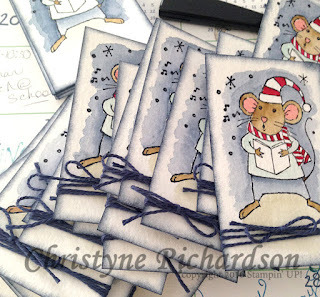 The Night of Navy Baker's Twine was the LAST element I needed to add to the mice - WOOHOO!!! Now I just need to assemble (everything is already cut) and add a sentiment and I'm DONE!!! This is the latest I have EVER completed my hubby's cards...my desk and table are a mess and I can't wait to get them OUT the door! HUZZAH!!! 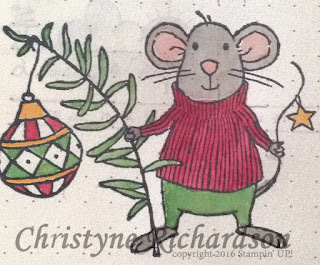 I'm using the Merry Mice for my hubby's Christmas Cards this year, but I just couldn't resist putting one of them in my journal too! Isn't he just adorable? I coloured him using my Aqua Painter and inks. 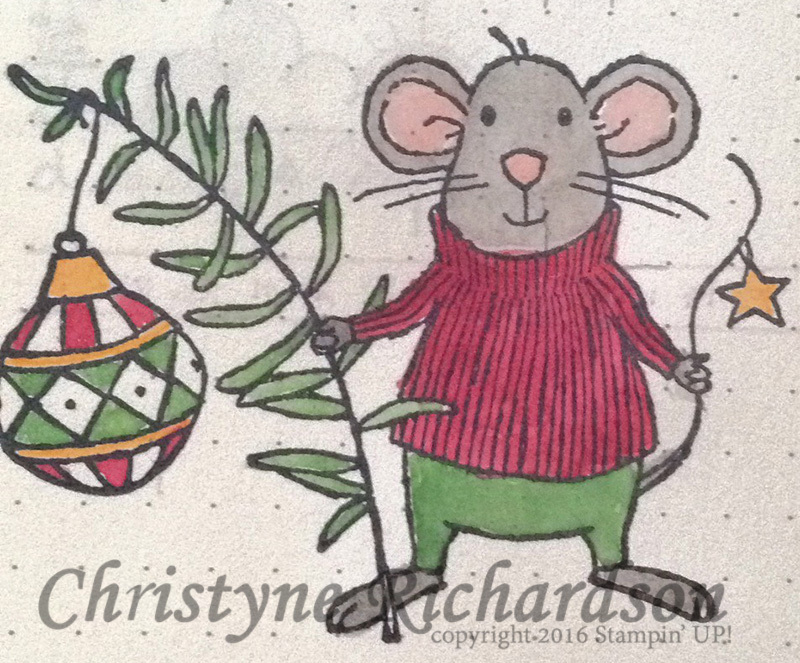 The little bauble was coloured using markers. Cute, eh?? Taking a break from cards today to work on some knitting. I felt like knitting with some happy colours today so that's what I did! I'll probably need the hat tomorrow since we're expecting 10-15cm of SNOW! What are you up to today?? Some items are selling out quickly, so don't delay!! 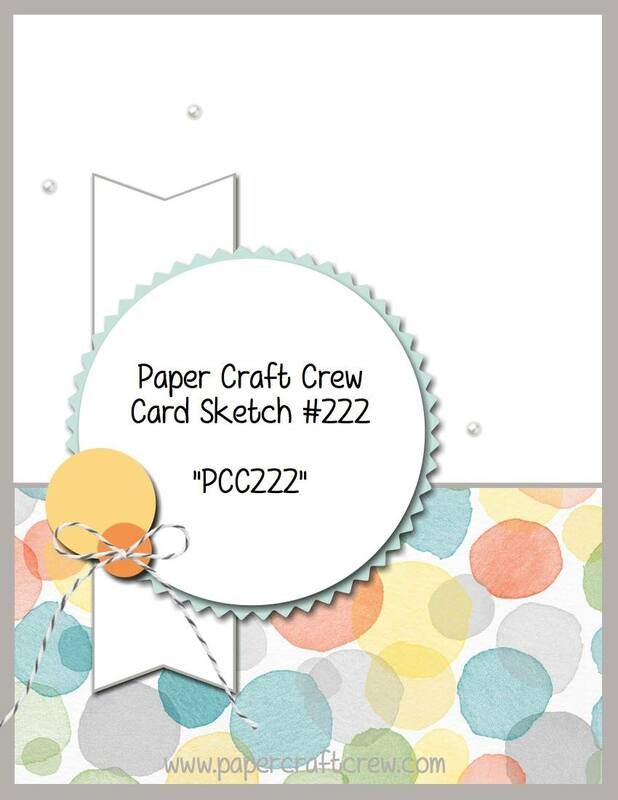 Click the image above to be taken directly to my store and use hostess code: BGF2QQUJ before checking out for a chance to win FREE Stampin' UP! products! Or gift enclosures...what do YOU like to call them?? During our class a couple of weeks ago, one of the projects we created was a simple fold-flat box. The original idea comes from Sam Hammond (an AMAZING UK Demonstrator) and I just made it a little bit bigger! The beauty of this little box is that you can make a whole bunch of them and store them flat till you need them! And they're just the perfect size to hold a few little treats. A ½ dozen small chocolates, maybe 2 or 3 cookies (don't forget to use grease proof paper or wrap them in our cellophane bags before putting them in the box) and you're all set to present a quick little gift! And speaking of little! Check this out!! The teeny tiny tag is just 1 ½" x 1 ½" and it has just enough space inside for a name and that's about it! The larger tag (gift enclosure) is 3" x 3" and has a little bit more room...maybe you can add "Love you" or something along those lines. So today's card took a different turn, but I LOVE the way it turned out! The Blooms and Bliss Designer Series Paper is STILL my all time favourite from the Annual Catalogue...but stay tuned! I have a NEW favourite in the Occasions Catalogue and I just know you're going to LOVE it too!! 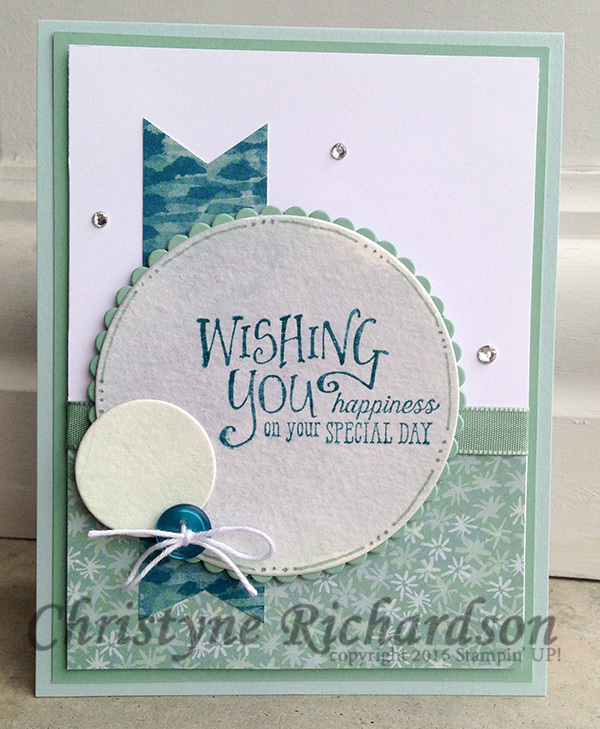 For the card, I started off with a base of Soft Sky and added a layer of Mint Macaron. 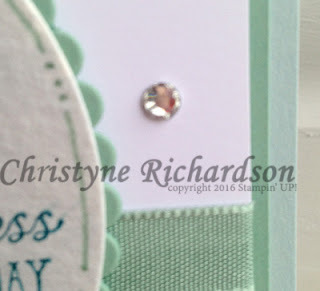 The next layer is a piece of Whisper White and a piece of Blooms & Bliss DSP and that got a ribbon wrap before being popped up on Stampin' Dimensionals and added to the front of the card. 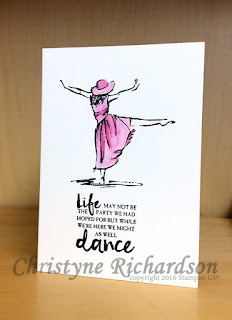 The image sentiment panel is a colour washed piece of Watercolour Paper and I stamped on it using an image from the Better Together Stamp Set and Island Indigo Ink. I doodled around the outside edge with my Mint Macaron Marker and attached it to piece of Mint Macaron Cardstock which was diecut with the Layering Circles Framelits. The smaller circle is was created the same way. I know the button is retired (sorry!) but it was just too perfect to pass up! I tied some Whisper White Baker's Twine to it and attached with a glue dot. And everyone knows that diamonds are a girls best friend, right? Guess what?? So are RHINESTONES! Year end Closeouts on NOW! Click the image below to be taken directly to my online store. 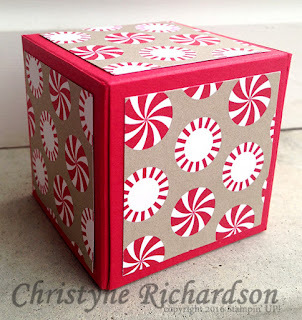 Be sure to add hostess code: BGF2QQUJ before checking out for a chance to win FREE Stampin' UP! products! Products available only while quantities last! The "something old" is the paper that I used as well as the little sequins (I can't find my darn rhinestones in the mess I've created leading up to all the craft shows!) and the something new is the DRAGONFLIES!! Oh. My. GOSH! Just wait till you see this new set! You're going to LOVE IT! 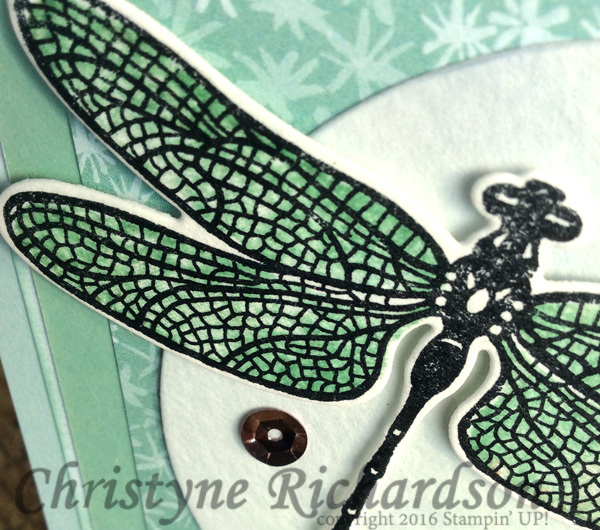 Something borrowed is the technique I used to colour my dragonfly wings. We learned it at On Stage and I just love it! I inked up the wings (they're a separate piece to the actual dragonfly skeleton) in Soft Sky and then sponged on some Mint Macaron in various places. Awesome right? I just love the way it turned out! And I love that no two dragonflies will ever be the same. 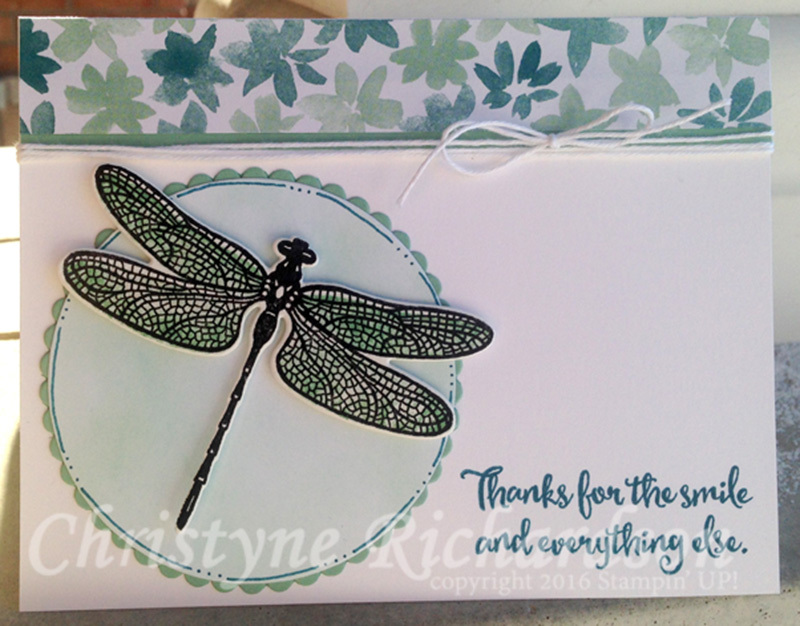 On the circle behind the dragonfly I did a watercolour wash using Soft Sky and Mint Macaron. There's a wee bit of Night of Navy on there too, but it's pretty subtle. You can see it better in person, so you'll just have to come to my Open House on Sunday January 8th, 2017 to check out this card and several others I'll be making over the next couple of weeks! Something blue is my Soft Sky Card base. 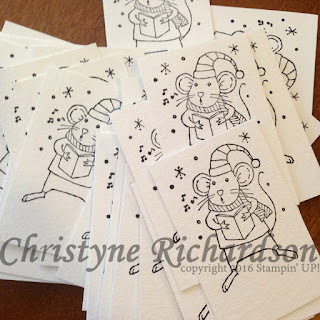 I couldn't decide which colour my little mice should be, so I coloured one in each of the colours I thought made sense and sent the image to my husband and a couple of friends to see what they thought. But everyone had a different opinion!! I know which is *my* favourite and I ended up using the one my husband preferred since they're his cards. But...what do YOU think?? Do you have a favourite?? Let me know in the comments, and I'll do a random draw! 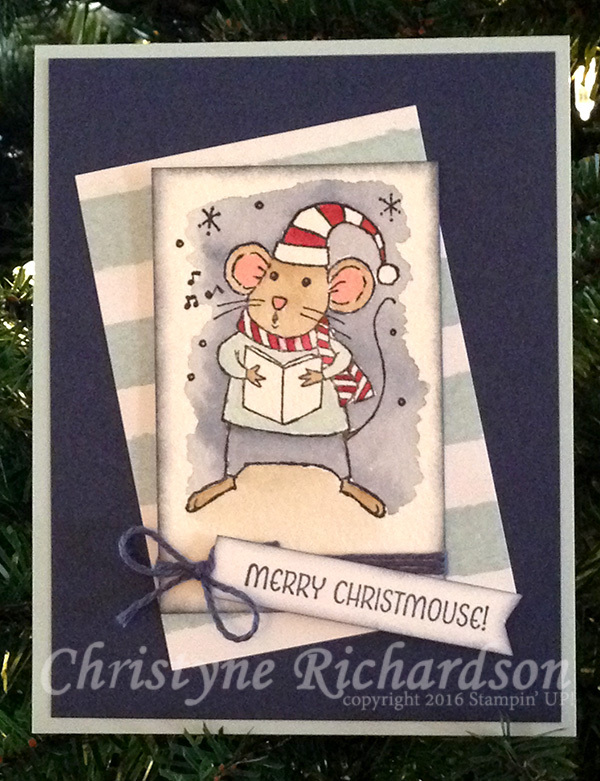 The winner will receive a Merry Mice Christmas Card! 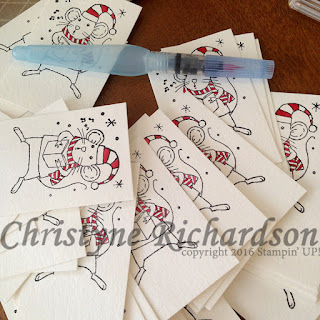 I started by colouring in the little hats using my Aqua Painter and Cherry Cobbler Ink. Tomorrow, I'll need your opinion so stay tuned!! Oh! Aren't these the cutest things EVER?? And here's a DEAL!!! 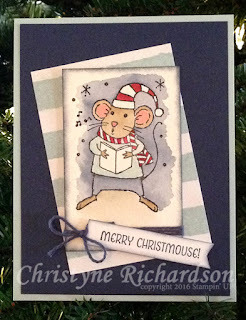 The Merry Mice are part of the Year-End Close Out! And the Photopolymer Set is discounted to $17.60! You can't beat that. 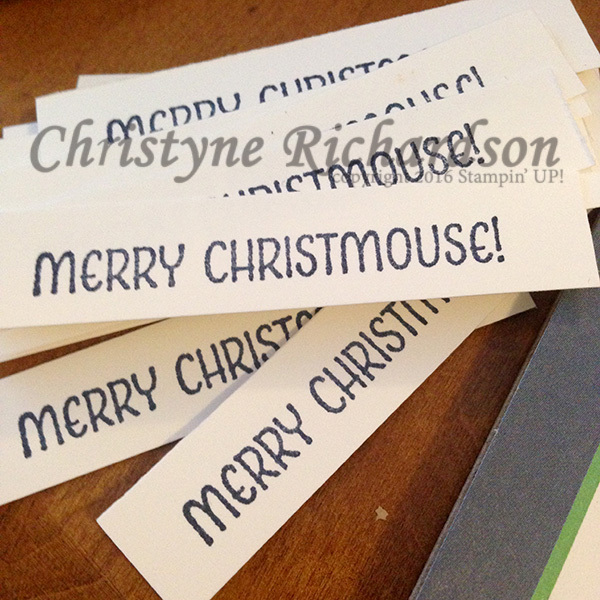 And if you order RIGHT NOW, you'll still have time to use these adorable mice for YOUR Christmas Cards. Be sure to use hostess code: BGF2QQUJ at checkout for a chance to earn FREE Stampin' UP! products. 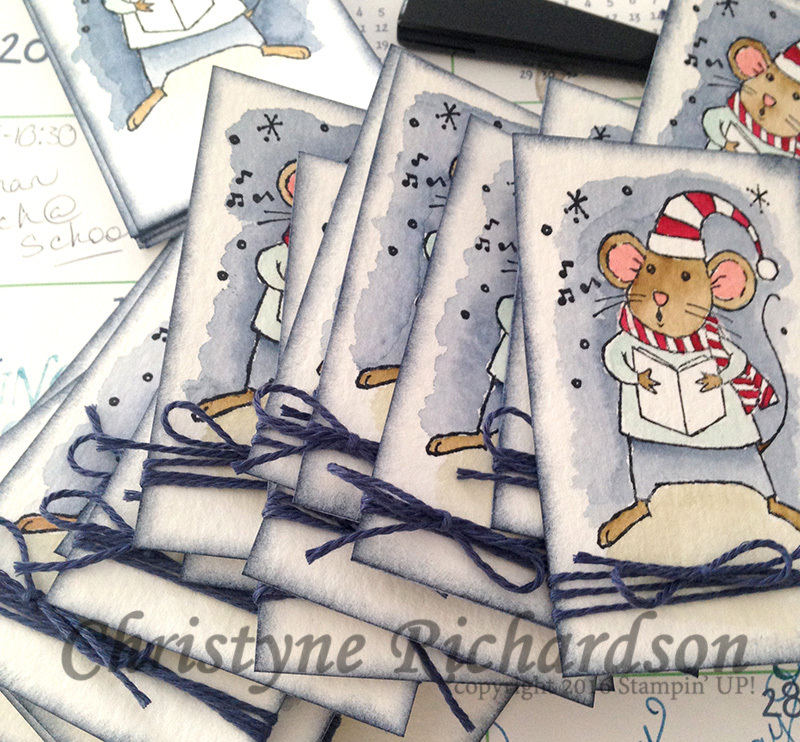 Stay tuned...I'll show what I did with the mice in an upcoming post! Tag! You're IT for 3-D Thursday! OH. MY. GOSH! Can you believe that it's ALREADY December 1st? Where did the time go!! I'm pretty sure that it was just yesterday that I was enjoying New Years Day brunch with my family and here we are with just 24 shopping days till Christmas. WHAT?? Don't you just love the little box? It was created with a 6 x 6 piece of Crumb Cake Cardstock using the Envelope Punch Board. You can create all the tags AND the box from just ONE sheet of 8 ½ x 11" Crumb Cake Cardstock. Talk about getting bang for your buck! 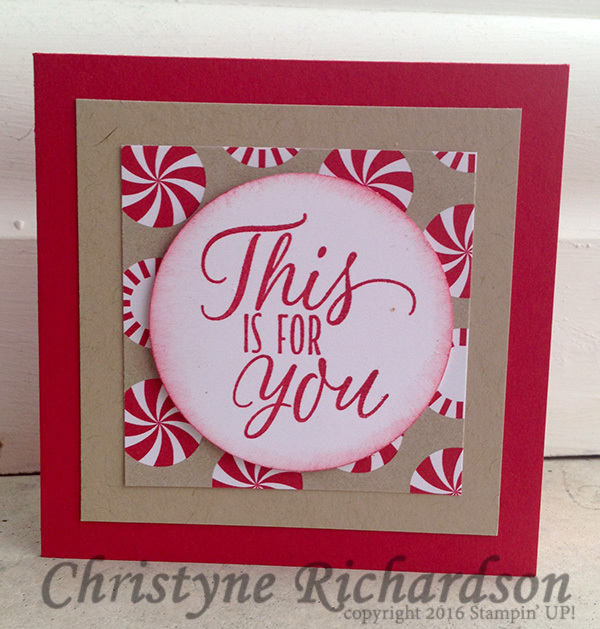 The box was wrapped with a 1 ¼" x 8" strip of Candy Cane Lane DSP and then I added the "This is for you" sentiment from the Tin of Tags stamp set. It was stamped in Garden Green and punched out before being added to a larger Garden Green Circle. Be-dazzling is a MUST at this time of year, so that was accomplished with three rhinestones. The circle was then added to the front of the box with Stampin' Dimensionals. Do you have a favourite? Let me know in the comments below and I'll do a random draw from all the comments and send the winner ALL of the tags in the set!